The bathroom is one of the spaces in a home that, when improved with a smart renovation, can give the average property a massive wow factor. However, the bathroom is often neglected, especially in rental properties, as it can be seen as too costly and complicated to renovate. 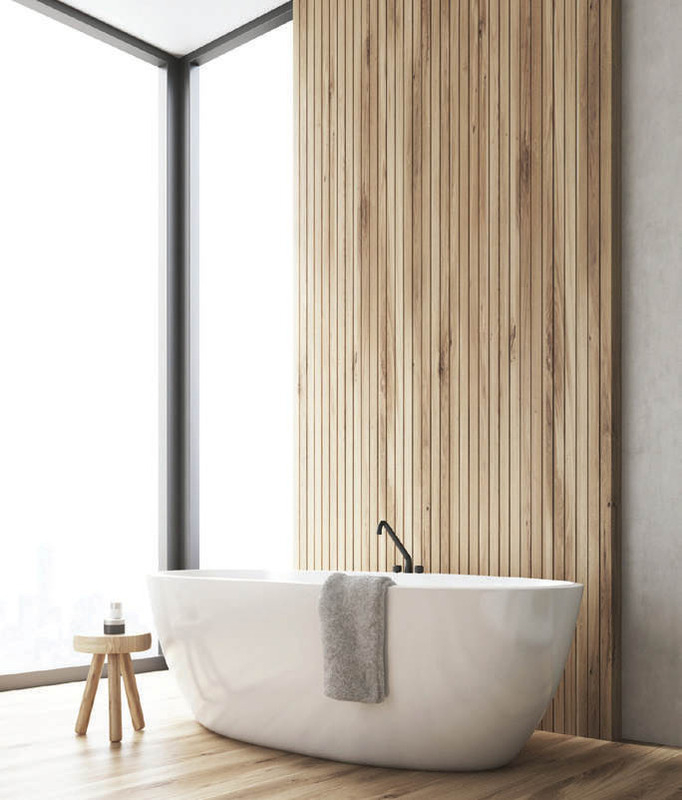 The reality is, putting your bathroom renovation on hold may be costing you thousands in potential rental income, not to mention the equity uplift. A $5,000 investment in your bathroom could come back to you in boosted rental returns within a couple of years, and the hike in value will help you grow your overall wealth. In terms of style, cascading rain showers, chrome fittings and carefully designed floor plans are now high on the tenant checklist. 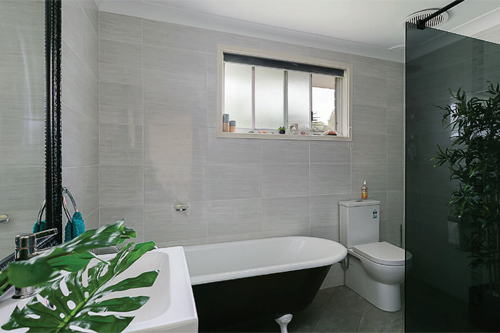 That said, Jane Slack-Smith from The Ultimate Guide to Renovation says she has seen the rising popularity of luxurious bathrooms in her years as a successful property investor, but she stresses that budget is still the most important factor to focus on when renovating an investment property. “Will a tenant pay more for a shower with changing colour lights? Probably not – this is a step too far. The aim is to renovate up to the level of the other renovated properties in the street and spend your money where it is seen,” she says. If you are a savvy shopper and can track down a gorgeous rain shower from an importer for the price of a standard silver one, then you can add a little wow factor and your budget will stay intact – so it’s about being strategic. 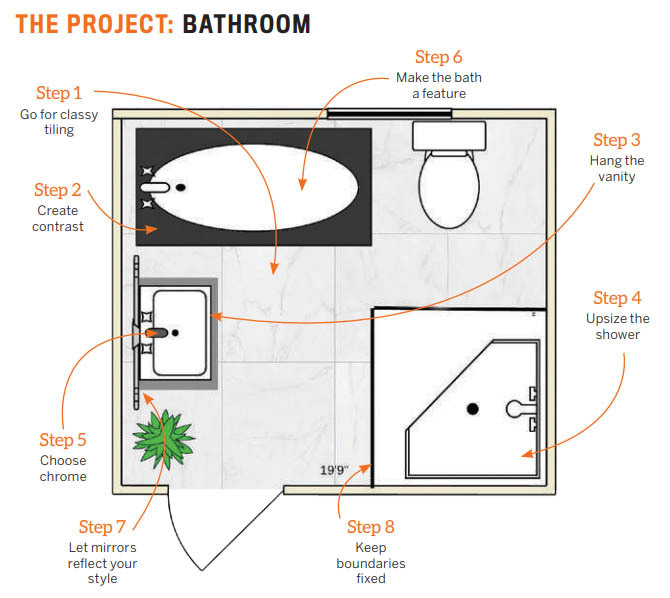 Careful planning can lift your bathroom out of the ordinary, and achieving the luxe look for less is possible with Slack-Smith’s simple tips. Tiling up to the ceiling is a fantastic way to add luxe appeal to a bathroom. Tiles are able to withstand the moisture conditions in this room, and are easier to maintain than paint. Opt for quality ceramic tiles over porcelain in order to stick within budget, and choose big tiles in a neutral colour with a rectified edge. The key to tiling a bathroom wall effectively is careful prep – know how many tiles you need based on the layout and the design of the tile itself. Tile suppliers often provide guidelines on how much wall a pack can cover. Ceramic tiles in an eggshell or alabaster hue can mimic the appearance of porcelain tiles. With regular cleaning and maintenance, your walls will always look as good as new. High-contrast colours are striking, so think about using dark tiles on the floor if you’re going with light-coloured walls. Many luxury hotels create this look in their bathrooms to really amp up the wow factor, as the combination creates depth. Contrary to what many may assume, however, dark-coloured tiles actually show dirt more than light-coloured tiles do, so if you’re renovating your own home you’ll need to consider your cleaning regime! Dark, wood-like tiles are also an option if you want to create a warmer atmosphere. Keep in mind that large tiles mean fewer grout lines, which can create the illusion of space. Unless you’re quite handy, tiling is generally best left to the professionals. This is particularly true when a high-end finish is required. If you don’t know what you’re doing, then hire someone who does. If your bathroom is small, wall-hanging vanities can give the illusion of more space as they reduce what is left on the floor. Vanity units come in different styles, makes and sizes to fit the design of the room. You can find anything from sturdy drawers to vanities with hinged doors. They also have various finishes, ranging from the always-popular white to wood. Neutral colours such as dark timber are beautiful and stand out against walls in soft shades, jazzing up the space. If you have room to spare, go for a double vanity. Always shop around, because you can find wallhung vanities for a wide range of prices. The units can also be accentuated with a nice mirror positioned above, and perhaps some strategically placed bottles. Consider using a double shower and oversized shower heads. Size really does matter when it comes to perceived value, and in this case bigger is better because the bathroom’s appeal goes way up! In addition to looking great, a double shower head adds extra functionality as it allows two people to shower at once. And who doesn’t love a rainfall shower head? It appears positively luxurious and ensures a clean shower since it has such wide coverage. You can adjust the shower head settings to go from a soft, light spray to the thundering patter of a waterfall. Replacing a showerhead is a tricky task, so ensure that you’re well up to it or you could do some damage. Opt for shower heads with easy-to-clean hoses and nozzles. Taps, towel ladders, soap holders and toilet roll holders all need to sparkle to add finishing touches to the bathroom. Chrome fittings will help highlight the luxe appeal. They are relatively timeless and will therefore stay relevant for years to come. Chrome is also an ideal material since it is resistant to the usual wear and tear that befalls bathroom fixtures. While not completely indestructible, it is made to be long-lasting, while maintaining a pristine appearance. Timely maintenance can keep your fixtures in top condition, such as regularly wiping away water spots and soap residue. You can also opt for replica designer tapware. It looks great, is cheap and conforms to American Standard. Make a habit of rinsing and drying the faucet after use to prevent build-up of spotting. A freestanding bath is a popular modern trend and is easier to install than your typical bath-hob combination. By itself, it can serve as a central feature of the room. However, like everything else in your renovation it should be suited to your target demographic. Families with young children will always look for a bathroom with a bathtub, so keep that in mind. Even though baths can be reasonably priced, after redoing the hob, tiles and plasterwork, the costs can add up quickly. For areas where a freestanding bath just might be a bit over the top, you might consider repainting the bath rather than updating it – this might give you all the lift you need. Another great effect is to have your mirrors going all the way to the ceiling. This creates the illusion of impressive proportions because reflections have a way of widening a small room. Unframed mirrors are a great option because they blend in with the background, allowing you to focus on what’s being reflected. However, if you’re looking for a feature element, a mirror with an interesting frame can become a talking point. Not only are big mirrors very useful but they also allow light to bounce around the space, making the bathroom seem lit up and airy. A backlit mirror can turn a simple bathroom into a den of glamour, while helping to serve as a light source. With one of these you can also create a minimalist look. If there is enough room in your shower area, install a fixed-glass panel instead of a shower screen. This creates a minimalist look while limiting the maintenance you need to do, since there will be fewer moving parts. In addition, clear glass panels can help highlight any feature elements in your shower, such as a beautiful tile pattern or stunning shower head. They can also limit mould because there is little water build-up along the door seals. Frameless shower panels are often customised to fit your space, so it’s important to know your measurements before you buy. Otherwise, it could cost you a lot to do replacements. Frameless panels are not good at preventing leaks because they lack the necessary seals around the door edges. Thus, it’s crucial to ensure that water does not spatter too much in their direction. When Tracey McMillan signed up to The Ultimate Guide to Renovation course, she had no idea a rusty bath would be the cornerstone of her NSW villa’s successful renovation. Before Tracey started, she sized up her potential renters. Tracey noticed a trend of Sydneysiders migrating to the Central Coast – and that the preferences of these seachangers differed from those of the generational residents. To attract the new renters, she veered away from the classic beach theme of the bathroom with its sky blues and seashell motifs, and created a more modern black-and-white look to really give it luxe appeal, with a contemporary design that allowed for pops of colour. Tracey also introduced a cloud-grey theme for the floor, and wall tiles to offset the high-gloss gleam of the bathroom fixtures and fittings. Even though she wanted the look of a luxe bathroom, sticking to a budget was a major concern. For instance, she knew that a black frameless shower screen would be the one piece that would lift her bathroom from ordinary to eye-catching; however, her first quotes almost blew the idea out of the water. Nonetheless, staying true to her original design was important to Tracey, and she was determined to find exactly what she wanted, within budget. A super buy from a major hardware store that was closing meant Tracey also secured high-end taps and accessories at very low-end prices. Finally, to finish off the bathroom, Tracey installed her grandfather’s old claw-foot bath, which pulled the whole scheme together. It was immaculately restored in pure white with a black detail and became the focus of a stunning bathroom. This modern bathroom renovation is the result of targeting a specific market, shrewd buying, and a dejected bath that’s now a star! FREE video course: How to Find, Renovate and Profit from Run-Down Properties. Disclaimer: All products and prices listed are correct at the time of printing. The advice contained in this article is for general information only and should not be taken as financial advice. Please make sure to speak to a qualified professional person before making any investment decision. How much to renovate a bathroom with dble vanity shower and toilet no bath. Midsle range tap wear.